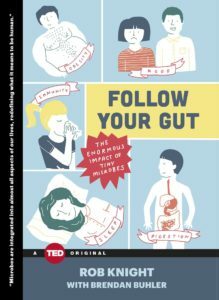 Recently several good books have been published about the community of microbes within us - our microbiota or microbiome. Originally I mainly saw the term human microbiome used everywhere. It referred to all the organisms living within and on us that are identified by their genomes (genetic material within the organism such as DNA and RNA). However, recently I'm seeing the term microbiota being used more. The microbiota refers to the community of microbes within and on us. Think of it this way: the human microbiota is the collection of all the microbes within and on us, and their genes are called the human microbiome. So there's a difference, but both refer to all the microbes within and on us. The human body contains over 10 times more microbial cells than human cells - thus 90% microbes (about 100 trillion microbial cells), and 10% human cells (about ten trillion human cells). It is estimated that the weight of all these microbes in an adult is about 3 pounds, which is about the weight of the adult human brain. Different communities of microbes live in different parts of the body - and each little part of the body has its own ecosystem or community. And there is variation from person to person in the types of microbes in each niche in the body. So knowing all this, it is time that to stop thinking about yourself as ME or I, but more of a collective WE. 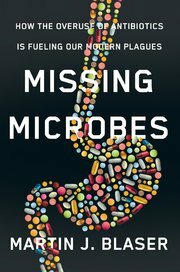 It is great to see some recently published books that explore this new and emerging field, discuss the importance of feeding and nurturing the microbes (and how), look at current and future medical uses of microbes. Because that's the exciting stuff. As I've been posting all along, our microbes seem to be intimately linked with our health - whether cancer or sinusitis (think how Lactobacillus sakei successfully treats chronic sinusitis) or many other ailments. I enjoyed all the books, I liked that the material was presented a little differently (as well as some different material) by each author, and that each book had reference lists. Martin Blaser, MD - Missing Microbes: How the Overuse of Antibiotics is Fueling Our Modern Plagues This is the most scholarly of the books (published 2014, and with lots of references), because he is writing not just from his own extensive personal and professional experiences, but also as director of the New York University Human Microbiome Program. He discusses the dangers of some modern medical advances (such as frequent use of antibiotics and Cesarean sections) to the human microbiome and how this may ultimately result in various diseases (modern plagues). I have posted about him various times, including an NPR interview about his book. The CDC (Centers for Disease Control) book review page also said: "Despite his emphasis on missing microbes, however, Blaser is wary of using probiotics, prebiotics, and synbiotics to restore microbial balance. He reasonably cites the challenges arising from the unsubstantiated claims of manufacturers and the paucity of well-designed trials to evaluate probiotics." 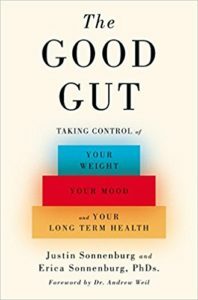 Justin Sonnenburg and Erica Sonnenburg, PhDs - The Good Gut: Taking Control of Your Weight, Your Mood, and Your Long-term Health This interesting book written is meant for the general reader, and they incorporate their personal stories (they are both PhDs working at Stanford University while raising 2 children) as well as what the latest microbiota research is regarding our health and bodies. They make the case that "caring for our gut microbes may be the most important health choice we make". They, like Dr. Blaser, argue that our microbiota are in peril from changes to the diet, overuse of antibiotics, and oversterilization, and is facing a "mass extinction event" which is leading to a number of modern ailments (allergies, asthma, etc). They even provide some menus and recipes to feed our microbes, recipes that stress dietary fiber. Some posts in the past year mentioned his research (especially the importance of dietary fiber in health). 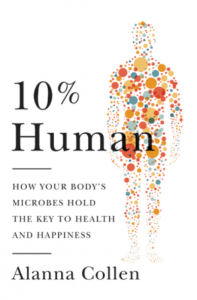 Alanna Collen - 10% Human: How Our Body's Microbes Hold the Key to Health and Happiness (Published 2015) This book is written in a chatty style by Alanna Collen, a British science writer with a PhD in evolutionary biology. She incorporates both her personal story and experiences with the scientific literature. There was much to like about the book and that it was "easy to read", but there were a few moments that I thought that the research in a discussion was incomplete (urinary tract infections come to mind). Previous article:Can You Have Too Much Medical Care? The books can be ordered from any online bookseller, including amazon.com or barnesandnoble.com.